Oncologic and Perioperative Outcomes of Laparoscopic Assisted Vs Hand-Assissted Vs Open Resections for Rectal Cancer Resection: A Case Match Study. Purpose: Advances in surgical techniques and improvements in laparoscopic instruments have enabled most colorectal procedures to be performed by using the laparoscopic approach.Laparoscopic surgery of colon cancer has been accepted to be oncologically adequate compared with open resection.However,the situation in rectal cancer remains unclear,because anatomy and complex surgical procedures.There have been only a few reports compare Laparoscopic assisted vs Hand-Assissted vs Open resections for rectal cancer resection. This study is designed to analyze oncologic and perioperative outcomes for selected patients;match by staging who undergoing in these three access of surgery. Methods: A total of 114 patients with rectal cancer,who underwent surgery by the same surgical team(2006-2008) are prospectively analyzed;by select the same staging.38 patients are choosen in each group. One-way ANOVA,Pearson’s chi-square and Fisher’sExact test are used to compare differences in demographics and perioperative parameters. Results: Each groups are comparable regarding age,gender,tumor localization,and complications.Each groups have 2/upper,6/middle,30/low rectal cancer and 5/stage 0,3/stage I,13/stage IIA,3/stage IIIA,9/stage IIIB, 4/stage IIIC,1/stage IV. 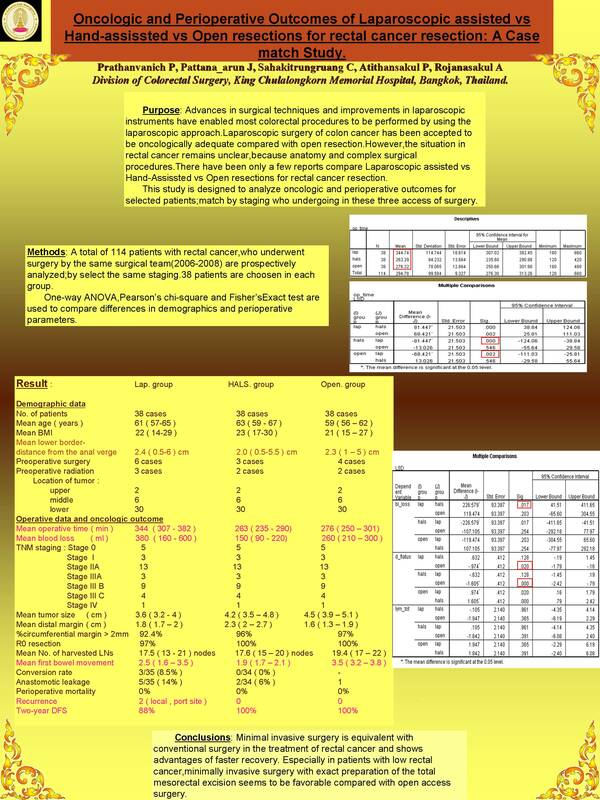 No mortality occurred in either group.Mean operative times are not difference significantly between open and HALS group(276 min/open vs 263 min/HALS, p = 0.546).But difference are found in these both groups with laparoscopic surgery(344 min/lap , p=0.002 and 0.000 respectively).Not difference significantly are found in first bowel movement between minimal invasive surgery(2.5 day/lap vs 1.9 day/ HALS , p = 0.128),but difference with open group(3.5 day/ open , p = 0.02 and 0.00 respectively).The mean tumor size is 4.5 cm/open, 3.6 cm/lap and 4.2 cm/HALS.The mean tumor-free margin is 1.6 cm/open,1.8 cm/lap and 2.3 cm/HALS group. And the mean number of harvested lymph nodes is 19.4 /open, 17.5 /lap and 17.6 /HALS group. No wound recurrene is observed. Conclusions: Minimal invasive surgery is equivalent with conventional surgery in the treatment of rectal cancer and shows advantages of faster recovery. Especially in patients with low rectal cancer,minimally invasive surgery with exact preparation of the total mesorectal excision seems to be favorable compared with open access surgery.